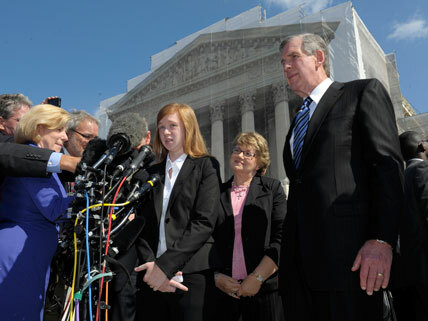 Abigail Fisher, the plaintiff in the Fisher v. University of Texas affirmative action case, talks to reporters outside the Supreme Court Building in Washington, DC, October 2012, accompanied by her attorney (at right). On June 24 the United States Supreme Court decided Fisher v. University of Texas, voting 7–1 to send the case on racial diversity in higher education back to the lower federal court for further review. In their decision, the justices chose to let stand earlier decisions on the matter, thus reaffirming that states do have a compelling interest in promoting diversity on college campuses. The Fisher case is a lawsuit brought against the University of Texas at Austin (UT) by a white female prospective college student who was denied admission to UT in 2008. The plaintiff contended that the university’s undergraduate admissions process, which considers race as one factor among others, resulted in her being excluded—because she is white. Some observers expected the Supreme Court might strike down UT’s policy for causing “reverse discrimination,” in violation of the Equal Protection Clause of the Fourteenth Amendment. The “color-blind” or “race-neutral” approach to college admissions has the support of most Americans, according to a recent Gallup poll. While the view that college admission should be based on merit alone is popular, many universities continue to seek ways to raise the number of minority students. The UT admissions policy that was challenged aims to foster diversity on campus by considering a range of factors, not just race. College applicants are evaluated in terms of such criteria as military service, academic honors and awards, extracurricular activities, community service, personal overcoming of disadvantages, leadership qualities, family responsibilities, socioeconomic status, and more. The Fifth Circuit Court of Appeals had ruled that UT’s policy was race-neutral. The Supreme Court’s decision in Fisher means that the lower court must review the policy again, applying the standard of “strict scrutiny” that the Court established in previous rulings on affirmative action. The conflict is between how to ensure, on the one hand, that individuals are treated equally and not discriminated against because of race, and how to achieve, on the other hand, “the educational benefits that flow from a diverse student body”—a goal previously endorsed by the Court. This blog provides all the official details of the Fisher v. University of Texas case: its history; transcript and audio of the oral arguments before the Court, the majority opinion, and Justice Ginsburg’s dissenting opinion. This report from the Gallup organization presents polling data on Americans’ views of the use of race as a factor in college admissions. Check out this three-sided “debate,” which presents a pro and con responses to the need for affirmative action, as well as a “middle way” compromise position. This article, from a website devoted to analysis of politics and policy related to communities of color, analyzes the Fisher decision from a point of view that advocates for diversity in higher education. University of Texas, voting 7–1 to send the case on racial diversity in higher education back to the lower federal court for further review. In their decision, the justices chose to let stand earlier decisions on the matter, thus reaffirming that states do have a compelling interest in promoting diversity on college campuses. The Fisher case is a lawsuit brought against the University of Texas at Austin (UT) by a white female prospective college student who was denied admission to UT in 2008. The plaintiff contended that the university’s undergraduate admissions process, which considers race as one factor among others, resulted in her being excluded—because she is white.